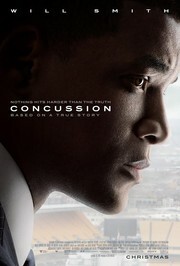 “You’re an uneducated quack,” declares the hostile voice over the phone, “And your career’s over!” That’s one of the several, threatening calls a Nigerian forensic pathologist, Dr. Bennet Omalu (Will Smith) will receive once his findings of chronic traumatic encephalopathy (CTE) in American football players is published. 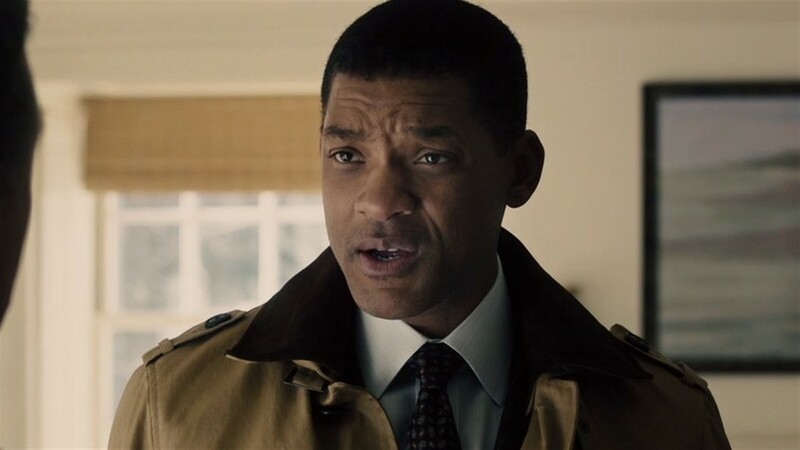 In the new real-life medical drama Concussion from director Peter Landesman, Dr. Omalu is given the task of performing an autopsy on a man called Mike Webster. Having no interest in football, Omalu has no clue that Webster (David Morse) was once a Super-Bowl winning center for the Pittsburgh Steelers. All the doctor knows is that this man on the slab before him was homeless, suffered mood swings and severe bouts of depression, plus he had intellectual impairment. So, why would such a young man die from what appears like symptoms of Alzhemier’s when x-rays show no abnormality of the brain? Probing further, and using his own money, Omalu ignores the order to move on. He performs more tests on the footballer. What he finds changes everything. Naively believing that his conclusive findings would actually help the NFL tackle the issue of concussions on the field, his findings are published in a 2005 medical journal. But the opposite occurs. Instead of treating the discoveries as a way of confronting the deadly issue, the NFL puts up blocks. The organization even asks for a retraction. “He’s a coroner in Pittsburgh,” an NFL official dismissively describes the doctor in a closed-door meeting. “He’s a nobody.” The NFL’s real fear, as later acknowledged, is that if the truth of CTE and its consequences are declared real, it would only take ten percent of American mothers to stop their children from playing the game and the whole, hugely profitable business of football would collapse. The fact that it’s kept afloat by the inconvenient truth of potential death for all players needs to remain out of the nightly news. But then new, similar cases emerge. Other, young retired players, once champions, follow the same path as Webster. Offensive lineman for the Steelers, Terry Long dies after drinking antifreeze. Autopsy tests reveal brain damage. Another Steelers player, Justin Strzelczyk (Matt Willig) acted irrationally and died in a car crash while driving at top speed against the flow of traffic. An autopsy reveals brain damage. Philadelphia Eagles safety Andre Waters (Richard T. Jones) shot himself. Same thing; brain damage. When the film sticks to its central theme, it’s a fascinating watch, and one that with 20/20 vision looks obvious; wouldn’t anyone realize that suffering repeated blows to the head and experiencing concussions time and again would naturally result with brain damage? Evidently, not when NFL doctors are on TV repeating the mantra that not only is there no evidence but it just doesn’t happen. It’s what fans and players with multi-million dollar contracts want to hear. This is not boxing, it’s football, and as Dr. Omalu discovers, no one wants to know about mental issues. Until, of course, a player shoots himself, or drives ninety miles an hour in the wrong direction, or pulls his teeth out and super-glues them back, or drinks half a gallon of anti-freeze because his damaged brain told him to. The problem with Concussion concerns the other, less successful factors. 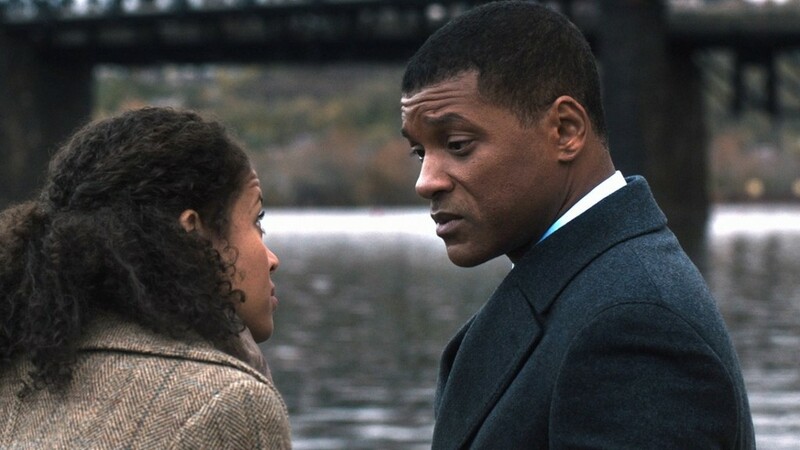 The relationship with the young woman who will eventually become the doctor’s wife, Prema Mutiso (Gugu Mbatha-Raw) often derails interest. Even though this is a true story, as presented on film, the events surrounding how Prema and the doctor meet and fall in love is never entirely convincing. Plus there are other areas of story-telling where the film tries too hard to introduce a mysterious conspiracy/thriller element that doesn’t really work. While driving at night, a pregnant Prema believes the car behind her is purposely tailing her, but to what end? To push her off the road? We’re never quite sure. The film even suggests that her following miscarriage was probably brought on by the stress of that vehicle. Are these the tactics to which a corrupt NFL would sink? We never know. Then there’s the issue of the FBI leaning on the doctor with some not-so thinly veiled threats, suggesting a move away from Pennsylvania would be acceptable to them. 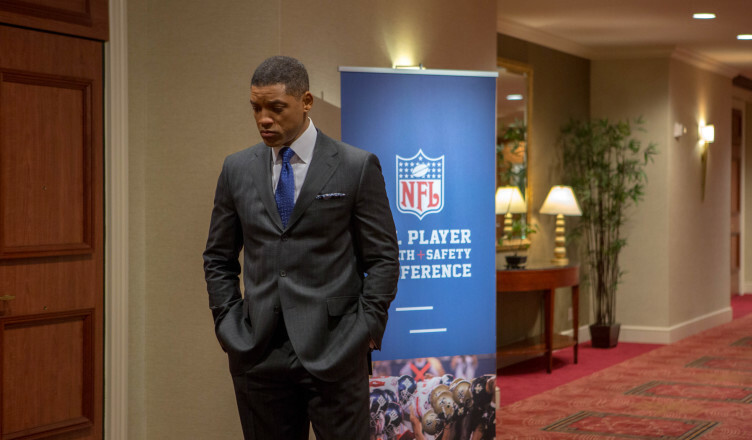 Again, is the film suggesting that the NFL was in some way responsible for the FBI’s bullying action? 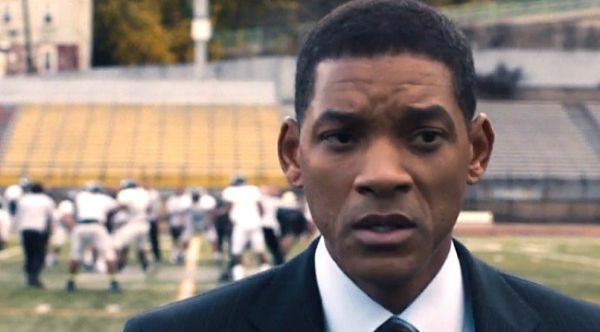 The film’s strength rests with Will Smith. It’s not a showy performance, it’s surprisingly understated, plus his Nigerian accent sounds authentic, but his determination to keep going puts audiences on his side, even if football crazy Pittsburgh, the NFL and, presumably, the FBI want him to just go away. If you recall the news events as they became public, maybe you’re thinking that the film might approach the role of the NFL in all of this with kid gloves. Don’t. Here, the organization is the villain, and by present day updates given at the film’s conclusion, they continue to be so. Payment to players who experienced CTE but are still alive has occurred, but there’s also an agreement that the NFL would not have to say what it knew of the effect of concussion on its brain damaged players and how long it knew it. Plus, we also learn that today 28% of all pro-players will suffer from CTE. Helmet or no helmet, you will look at your son practicing on the field after school in a different light. It would be madness not to.